Satellite image shows view from space of smoke obscuring the sky over parts of southwestern B.C. Jul. 5, 2015 5:00 a.m.
An air quality advisory issued Sunday afternoon for Metro Vancouver is continuing and has been extended to the Fraser Valley as a result of smoke blowing into the region from wildfires raging across B.C. Metro saw elevated particulate in 2012 – with readings briefly spiking towards but not above 100 – as a result of smoke from wildfires in Siberia. There was also more localized smoke in 2005 from a fire in Burns Bog. There’s no single fire to blame for the smoke. Significant amounts of smoke are coming into the Lower Mainland from fires burning west of Pemberton. 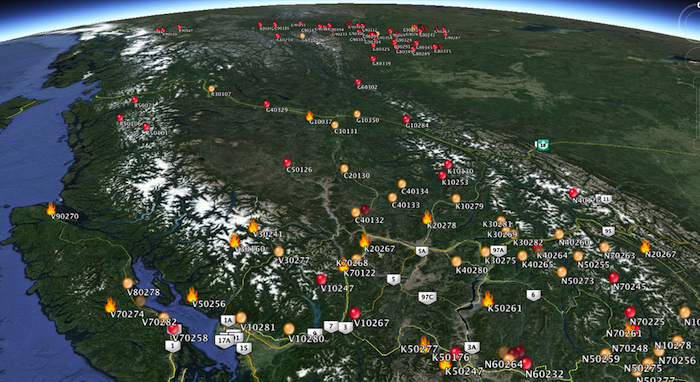 But nearby fires are also burning on Vancouver Island and on the Sunshine Coast near Sechelt. And officials say more distant fires burning elsewhere in the B.C. Interior and beyond have also brought smoke here because of a lack of winds blowing onshore from the ocean. “The winds have been shifting quite a bit in the last couple of days,” Doerksen said. He said there are two smoke layers – one ground level and one higher aloft – affecting the Metro area, with upper level smoke coming from more distant sources. But as of Monday, hot, sunny weather is currently forecast to persist through the week. Even worse, lightning is possible Thursday night in the Manning Park area, according to Coastal Fire Centre information officer Ellie Dupont. The smoke blotted out the sun in much of the region and there have been reports of ash falling over a wide area. “People from Port Hardy and Salt Spring Island and many other areas have been calling in saying there’s ashes all over their decks and their boats,” Dupont said. Provincial officials are considering a ban on the use of ATVs and motorcycles in the backcountry to prevent more fires from being sparked. “A lot of forest companies have shut down their private lands and put up gates,” Dupont added. “We’re hoping with all the smoke more people will think about the fires that are burning and be more careful,” she said. There have been 85 fires so far in the Coastal fire region this year. Fourteen new ones have been sparked since Sunday and three of them were caused by people. The province is bringing back all firefighting crews it had previously sent to Alaska and the Northwest Territories. After a couple of days of rest, they’ll be back in action battling B.C. wildfires. Delta has closed its Watershed Park and Delta Nature Reserve to the public in an effort to reduce the risk of a fire in those wooded areas or Burns Bog. People with chronic underlying medical conditions should postpone strenuous exercise until the air quality advisory is lifted, according to the regional district. Stay in a cool, air-conditioned environment and reduce other indoor sources of air pollution such as smoking and vacuuuming. This is the second air quality advisory issued in the region this year. An earlier one lasting two days in June was due to ground-level ozone. Avoiding the use of gas-powered mowers and other equipment, and taking transit or carpooling instead of driving can avoid further adding to the region’s air pollution problem.